Eating: It’s A Slow Ride. So Take It Easy…. Yep, I have been slow cooking again. I love that I can say that now. Santa brought us a large oval slow cooker this past Christmas and we have been going to town trying to perfect our pot roast recipe. But, you can only eat so many big hunks of meat with potatoes before you start to get a little bored and want to try something new. Thank goodness my mom, er, Santa, also brought us a new slow cooker recipe book. 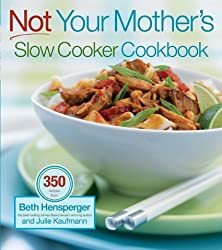 It’s called “Not Your Mother’s Slow Cooker Cookbook”. If you only pull your slow cooker out for your basic pot roast recipe than I highly recommend this book. It has 350 recipes, like the one below, and they all seem pretty incredible. Yesterday I decided I needed something sweet, but I did not want to pack up the 6 month old just to run to the grocery for a sweet tooth fix. Instead I decided to try the Carrot Cake recipe in this book. Yes, you read that correctly – CAKE! Once it’s done, turn the cooker off, remove the lid and let it cool for 30 minutes. Later you can run a knife or spatula around the edge to loosen it from the cooker and pop it right out and on to a serving platter. Cream cheese icing was added to make it as authentic as possible for the taste test. And, boy, was this cake goooooooooooooooooddddd! It came out with a nice color, and the texture or crumb is just what you would expect from a cake baked in a regular oven. It also came out perfectly moist. MMMMMM!!! On a funny note, the Mister crinkled his nose at me when I told him I made carrot cake for desert since anything with veggies (especially carrots) makes him turn and run. Later I made us some tea and cut a small slice for him along with a bigger slice for me (I knew he would ask for a bite and end up eating all of my cake if I didn’t go ahead and bring some along for him- see I’m not so dumb after all). I brought the whole shebang up to our bedroom for some cozy TV viewing and before I knew it he had gobbled up my big slice and was eyeing the little one too. Ah man, don’t I know my Mister…I just had to laugh! He even grabbed a couple more slices for his breakfast this morning! This recipe really is very tasty with just the right amount of spice and of course the cream cheese icing was the perfect topping. Also, I was thinking that the oval shape of my cooker means I could create a pretty cute egg shaped cake to decorate for Easter. HHHmmmmmmm…I am thinking brunch menu planning is in my near future. So, have you guys made any unorthodox recipes in your slow cooker that you can share? Send them to me. I want to try anything that sounds yummy!